When the first episode of Bad Universe aired, my Aussie friends complained about us choosing Sydney as the impact site of a small asteroid. We chose it because most other major cities have already been wiped out in TVs and movies, and the Sydney Opera House was so iconic we knew it would make a great visual (it did). That’s Shoemaker (formerly Teague) Crater, an old impact crater about 30 km (19 miles) or so across. It’s a bit tough to see, but it’s the oddly wobbly circular shape right in the middle of this photo. 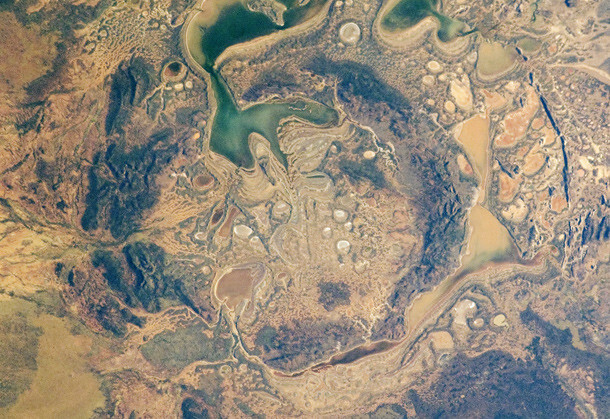 Craters this big are hard to see from the ground, and are easier to identify from space; this shot was taken by an astronaut on the International Space Station. Like many large craters, it has multiple rings around it, probably formed as massive shock waves from the gigantic impact slammed through the ground. There’s a ridge at the bottom of the high-res photo that’s part of a heavily eroded outer ring. 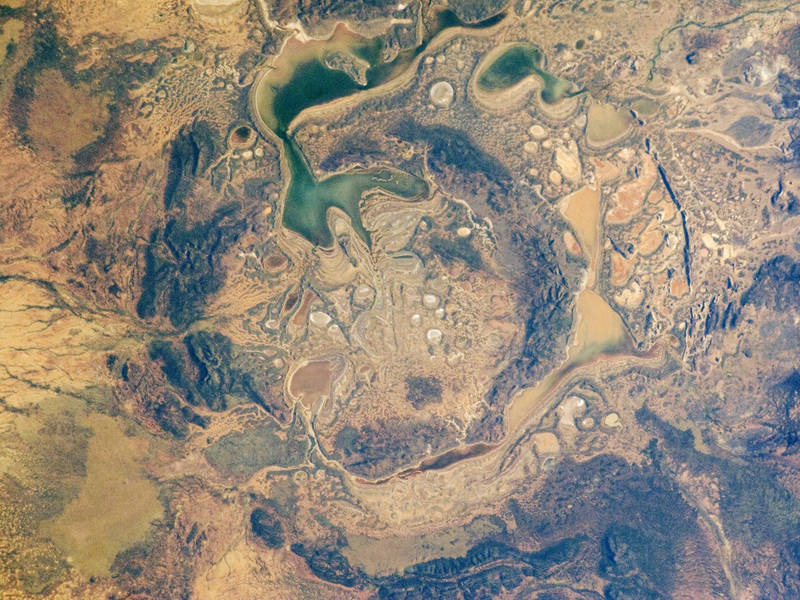 This crater is in the Outback, with mostly brown rock punctuated by colorful salty lakes. I knew it was old just by glancing at it. Young craters look young: fresh, sharp rims, obvious outlines, sometimes surrounded by rays (long, straight features pointing away from the center of the crater, formed when plumes of ejected material collapse). This one is sloppy, vague, faded. Estimates of its age vary. It may be as young as 570 million years, or as old as 1.3 billion years! Some estimates put it even farther back along Earth’s timeline. Australia itself is ancient, with some parts having been around for 4 billion years. This crater dates back to the Precambrian age, when the most sophisticated lifeforms on Earth were soft multi-cellular microscopic creatures; the first true fossils of hard-shelled life were still millions of years in the future, even for the younger age range of the crater. It’s hard to imagine that our lush green and blue Earth was once covered with craters like this. Heck, a few billion years ago this one would’ve been considered small! But two things have changed that: for one, the solar system had a lot more rocks to toss at us back then. Things have thinned out considerably in the past few billion years. Plus, the Earth isn’t static: it’s dynamic, with erosion and continental drift wiping out really old craters. Only a few survive now, the ones that happened to be in very stable locations like this one. Studying them is like having a direct line to the past, though muffled by time and change. Still, it’s an amazing look into what things were like before life took hold on land all those eons ago. Oh, one more thing: if the name is familiar, it should be. It’s named after Eugene Shoemaker, a geologist who was a pioneer in studying and identifying impact craters like this one. He died in 1997 in a car accident in Australia, so it’s fitting a crater there was named in his memory. Bad Universe to air on Discovery Latin America Friday! Starting Friday, my TV show "Bad Universe" will air on Discovery Channel Latinoamérica, which I think covers Central and South America. Check your local listings. The name has been translated to "Mitos Del Universo", which of course means "universal mites"; a clear reference to the second episode "Alien Attack"… which itself was translated to "¡Ataque extraterrestre!" But then, my Spanish isn’t very good. I hope they got Antonio Banderas to dub my voice, though. That would be muy bonito. Tip o’ the asteroide to eltiocesar. I just got word that my three-part science TV show, "Bad Universe", will be airing in Brazil soon! I can’t embed it here, but they have a promo video up at that link. I had no idea I could speak Portuguese. Actually, for the dubbing, they did get someone who sounded a lot like me (and used me own voice as well, like when I said "Whoa!"). Anyway, this is cool news, especially since it’ll be airing in the UK very soon too. I don’t know when exactly it’ll air in Brazil, so if you live there keep your eyes on the DiscoveryBrasil site. Tip o’ the Brazil nut to Carlos Cardoso. I’ve just learned that all three episodes of my TV show, "Phil Plait’s Bad Universe", will air in the UK on DiscoveryUK from August 15th through the 17th. The air times vary, so check the link to find out when it’s playing. Sky TV has clips online to give you a taste of the three episodes: Asteroid Apocalypse , Alien Attack, and Death Stars. If you sense a theme, well, read the title of the show again. And by the way, the DVD set is available on the Discovery Channel store and at other online venues like Amazon. Perhaps you’ve seen the video of George Hrab and me performing his song "Death from the Skies". And perhaps you’ve seen my own show, "Bad Universe". After all, these are the real ways the world will end. I am endlessly fascinated by impact craters. You might think they all look alike, but they don’t. They have different shapes, structures, shading, even (sometimes) colors. And these features can tell us a lot about the object that caused the impact as well as the structure of the surface they hit. That image is 500 meters (.3 miles) across, so this is a decent-sized hole [click it to enlunanate]. Note the rubble; that’s a clear indication that the surface of the Moon where the object hit was rocky as opposed to sandy. You only get fractured boulders like that when the impacted surface has some cohesion. 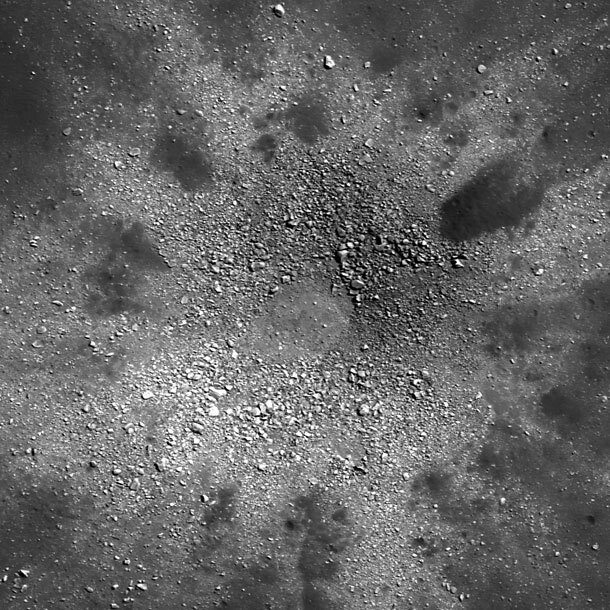 Most of the Moon is covered with a layer of dust called regolith, but here, under that powdery surface, was rock. Yesterday I posted a video showing a cluster of sunspots forming on the Sun’s surface. As it happens, a new video was released last night from NASA’s Solar Dynamics Observatory satellite showing this same sunspot group, but this time, along with the visible light images, we also get X-ray images. X-rays are emitted by plasma trapped in magnetic fields, so in a sense you can actually see the magnetism of the sunspots as they evolve. Watch! How awesome is that? The full disk picture on the left combines visible and X-ray light, the lower right shows the spots in just visible light, and the upper right is just X-rays. You can see the magnetic field lines looping from one part of the sunspot cluster to another as the plasma follows them. If you look carefully, you’ll see flashes of brightness, too: those are solar flares! The magnetic field stores energy. If the loops get tangled together, they can snap and release their energy in one sudden burst (like a box full of mousetraps, if you happened to see my episode of "Bad Universe" on Discovery Channel yesterday). What’s interesting about this video is that it shows that the rotation of the sunspots plays into this too. Imagine a bunch of magnetic field lines coming from a spot, going up above the Sun’s surface, then back down to another spot. If the spot is rotating, that cluster of loops will get twisted up, just like a rubber band gets twisted when you rotate one end (do you kids these days still play with balsa wood airplanes that use a rubber band to spin the propeller? It’s just like that). If the loops get too twisted, they’ll snap, too, and kablam! Solar flare. Remember, this was the biggest flare seen in several years, so apparently having several rotating spots feeding into the system really pumps a lot of energy into the loops. That makes sense, and it means that clusters of spots may be the ones we should keep our eyes on if we want to catch big flares in the act. Video credit: Movie produced by D. Brown (UCLan). Data courtesy of NASA/SDO and the AIA, EVE, and HMI science teams. Well, it’s been a while coming, but I’m pleased to let y’all know that the third and final episode of "Bad Universe" will air on The Discovery Channel tomorrow, April 19, at 11:00 a.m. Eastern (US) time — but of course, check your local listings. The episode is entitled "Death Stars", and is about the effects of solar flares and nearby supernovae. Like the other two, this was a lot of fun to put together, though the trip to Sandia Lab still haunts me a bit… but I won’t give that away. You’ll just have to see. I actually haven’t seen the final cut since we put it together late last year, so to be honest when I watch it tomorrow it’ll be a bit like seeing it again for the first time. Speaking of which, my daughter will be in school when it airs, so I won’t watch it until we can see it as a family. That means I won’t be live-tweeting or anything like that. And to answer the inevitable question: I don’t know if the network is picking it up as a series or not. I expect the ratings of the airing tomorrow may play into that, so tell a friend! Or tell a few dozen. I hope you like it, and have at least as much fun watching it as I did making it.